The final value of PHYBIBCO is obtained by calculating a weighted arithmetic mean from the individual parameters’ results. As these parameters assess different variables (ecological significance/species number, depth limits) and use different class boundaries as well as value ranges, they have to be normalized to the 0-1 intervals before they can be averaged. 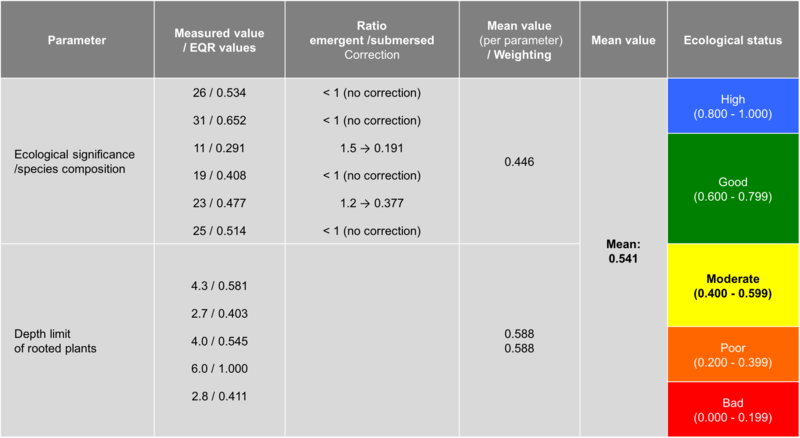 The scientific data availability for the parameter depth limit of rooted plants is better than for the other parameter and subsequently this parameter uses a weighting factor of two. At the same time this final value constitutes the EQR (Ecological Quality Ratio). If the depth limit is not assessable within the whole water body (e.g. if the natural depth range is not wide enough), the final value is equivalent to the one value of the parameter ecological significance. The currently valid requirements for field survey, data analysis and evaluation of PHYBIBCO are described in the guidance document (Fürhaupter & Meyer 2015) in detail and are also listed in the monitoring manual (in German only) of the German federal and state monitoring program (BLMP).